Manufactured by Stable Micro systems, U.K.. 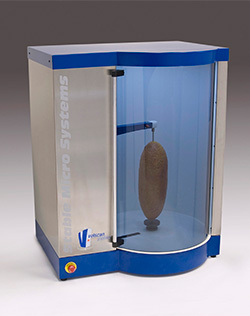 The VolScan Profiler or Bread Volume Tester is a benchtop laser-based scanner that measures the volume of bread and bakery products up to maximum dimensions of 600mm length and 380mm diameter. It enables the rapid 3-dimensional digitisation of products, the results of which may be processed mathematically to yield detailed dimensional information for immediate use or future retrieval. It uses a non-contact measurement method and therefore offers considerable advantages over contact and displacement alternatives, particularly for the 3-dimensional assessment of soft products. It gives rapid assessment of Bread volume, Specific volume, Length, Maximum width, Maximum height, Volume yield per 100g flour.